By now you know about my penchant for cheese. No, it is not the only thing that I eat. Hook and I both love to try different food when we travel, seeking out places frequented by locals and travelers in the know. Along with the local places, we mix in some fine dining to round out our experience. The internet and travel forums have been invaluable in helping us research restaurants to try. So it is only fair that we contribute our own dining experiences to help other travelers. We were a little taco’d-out and wanted something different… just plain grilled meat. Our fellow guests at Playa Azul Hotel who have been coming to Cozumel for many years raved about the steaks at this place, so we figured, why not? It is a cozy place with a few tables outside and a few inside. We chose to dine inside in a/c to escape the humidity. We both opted for sangria instead of wine. Apparently I had not learned my lesson yet… Yup, it is not the spanish type sangria that we are accustomed to. Once again it was red wine with lemonade, it seemed. The steaks were very, very good… comparable to the fine steakhouses in the U.S. 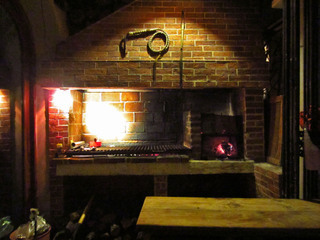 They have two types of meat for each steak choice, a “Nacionales” (ie. Mexican steak) and a “USDA”. The Playa Azul guests told us to make sure we get the USDA type as it is much better, so we did. The steaks did not disappoint. Hook ordered the churrasco steak, while I had the filet mignon. Both were perfectly cooked the way we ordered them. Total bill was Mex$670 (roughly $54) including the gratuity — inexpensive for this kind of restaurant and the amount of food they give you! Hook declared this to be his favorite restaurant. It will surely be on our restaurant list for future visits.